In this fully revised and updated third edition of China in the 21st Century: What Everyone Needs to Know®, Jeffrey N. Wasserstrom and Maura Elizabeth Cunningham provide cogent answers to urgent questions regarding the world's newest superpower and offer a framework for understanding China's meteoric rise from developing country to superpower. Framing their answers through the historical legacies - Confucian thought, Western and Japanese imperialism, the Mao era, and the Tiananmen Square massacre - that largely define China's present-day trajectory, Wasserstrom and Cunningham introduce readers to the Chinese Communist Party, the building boom in Shanghai, and the environmental fallout of rapid Chinese industrialization. 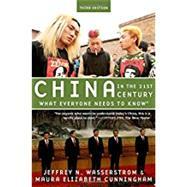 They also explain unique aspects of Chinese culture, such as the one-child policy, and provide insight into Chinese-American relations, a subject that has become increasingly fraught during the Trump era. As Wasserstrom and Cunningham draw parallels between China and other industrialized nations during their periods of development, in particular the United States during its rapid industrialization in the 19th century, they also predict how we might expect China to act in the future vis-à-vis the United States, Russia, India, and its East Asian neighbors. Jeffrey N. Wasserstrom is a Professor of History at the University of California, Irvine. His previous books include Global Shanghai, China's Brave New World, and Twentieth-Century China. Maura Elizabeth Cunningham is an Associate at the University of Michigan's Lieberthal-Rogel Center for Chinese Studies. She has written on modern Chinese history for the Wall Street Journal and the LA Review of Books.